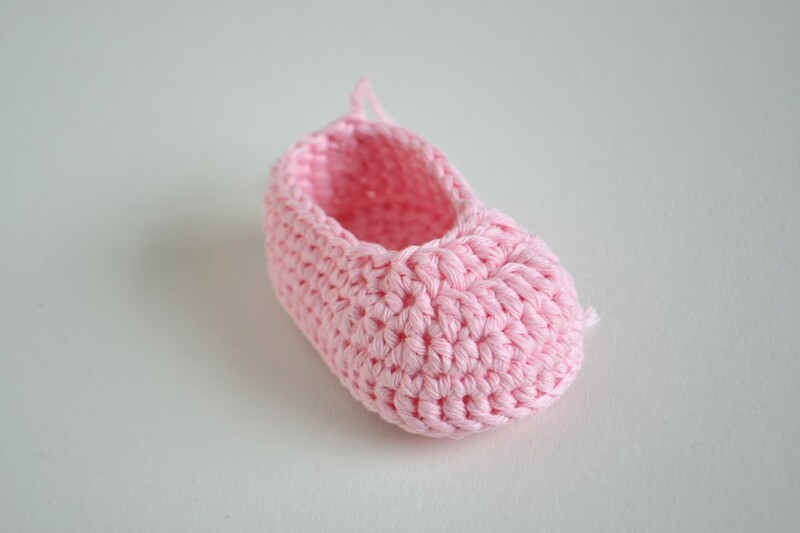 You can find more cute crochet baby booties designs HERE. 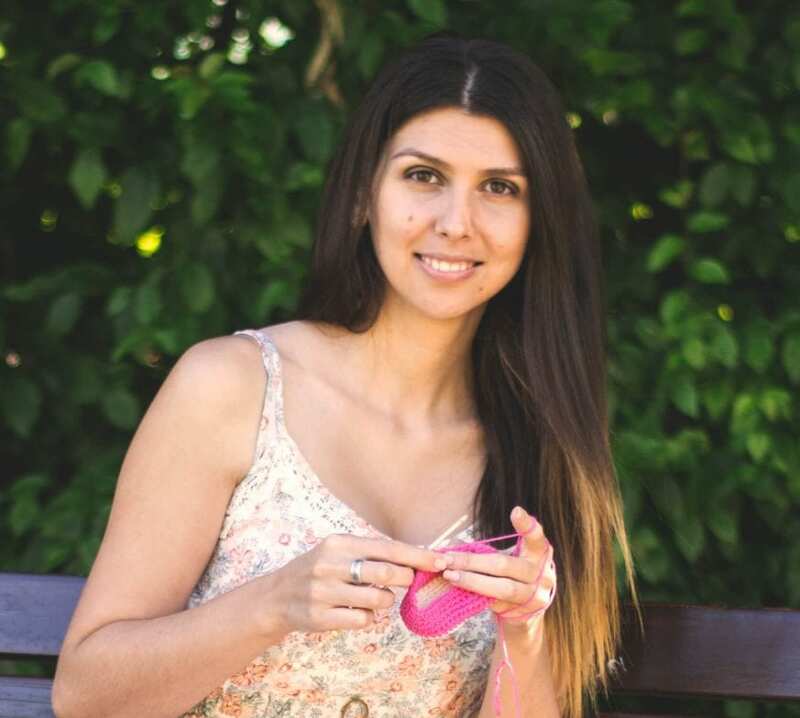 I would like to share my work with as many crocheters around the world as possible, please help me out and share the link to the pattern with your friends that love to crochet too. It would mean the world to me. 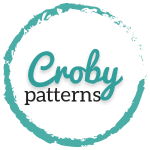 You can read all about using the pattern and selling the items using Croby Patterns designs HERE. Gauge: 22 sts and 24 rows in sc measure 4 x 4 inch (10 x 10 cm). sc2tog – join next two sts with sc2tog. Round 1: Start in the 2nd chain from the hook. Make 2 hdc into the same. Hdc 7 (10). Make 5 hdc into the last chain from the hook, now start on the other side. Hdc 7 (10). Make 3 hdc into the last one. Join the round with ss. Round 2: Ch 1. Start in the same stitch. Make 2 hdc into next 2. Hdc 7 (10). Make 2 hdc into next 5. Hdc into next 7 (10). Now make 2 hdc into last 3 stitches. Join the round with ss. Round 3: Ch 1. Start in the same stitch. Repeat (2 hdc into the same st, 1 hdc into the next one) two times. Hdc into next 7 (10). Repeat (2 hdc into the same st, 1 hdc into the next one) five times. Hdc into next 7 (10). Repeat (2 hdc into the same st, 1 hdc into the next one) three times. Join the round with ss. You will need one sole for each shoe. Find center back stitch of the sole; fold the sole in half lengthwise. The stitch in the fold on is the one that you want. The upper part of the shoe is worked with hook going from outside of shoe to the inside and the nicer side of the sole should be on the outer side of the shoe. You should start each round in the joining stitch (ss) which should be in the center back of the heel. Do not count the chain or ss stitch as a stitch at the beginning/end of the round. Round 1: Start in the middle of the heel. Ch 1. BPhdc all the way around. Round 2: Ch 1. Sc into the same st. Sc into next 43 (49) sts. Join the round with ss. Do not turn! Ch 1. Sc into the same st. Sc into next 10 (13). Repeat (hdc2tog, hdc into next 2) 5 times. Hdc2tog into the next. Sc 11 (14). Join the round with ss. Do not turn. Ch 1. Sc into the same st. Sc into next 11 (14). Hdc 1. Hdc2tog. Dc2tog 4 times. Hdc2tog. Hdc into the next one. Sc into next 12 (15). Join the round with ss. Round 5: Ch 1. Sc into the same st. Sc into next 10 (11). Hdc2tog. Repeat dc2tog three (five) times. Hdc2tog. Sc 11 (12). Join the round with ss. Ch 2. Work all the sts into 2nd chain from the hook: 3 hdc, 3sc, 2hdc, 2sc. Join the round with ss into the first stitch of the round (not chain!). Fasten off and a leave long tail for sewing. You will need two noses, one for each shoe. Using a white yarn and yarn needle make two lines on the nose as seen in the picture. Ch 2. Work all the sts into 2nd chain from the hook: sc, hdc, dc, ch 2, dc, hdc, sc. Fasten off and a leave long tail for sewing. You will need four ears, two for each shoe. Idea: You can create a little bow for piggy and place it in front of one ear (I would place it on the outer ear on the each shoe). You can find the tutorial how to create a little bow HERE. Now place the nose, ears and eyes on the front side of the each shoe. Ch 10. Make a first strong knot at the end of the tail. Then place the tail on the middle of the heel into the 4th round of the upper part. Now make one more knot, this time very soft one out of the tail. Hope you enjoyed the pattern! These are pig-a-licious!!! Thank you for such a sweet, pigdorable pattern!! 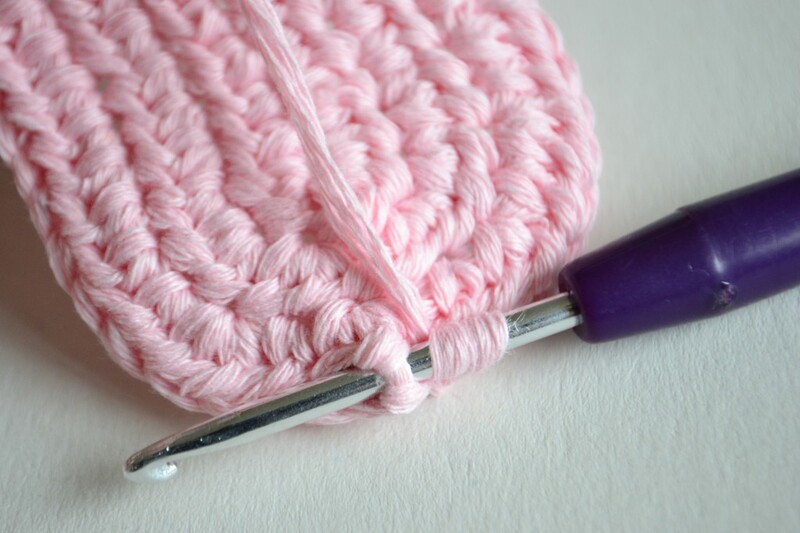 The easiest way is to use a larger crochet hook and a thicker yarn than the one specified in the pattern. Crochet one sole, then check if the final size of the sole is the size you want. If yes, continue on the upper part. 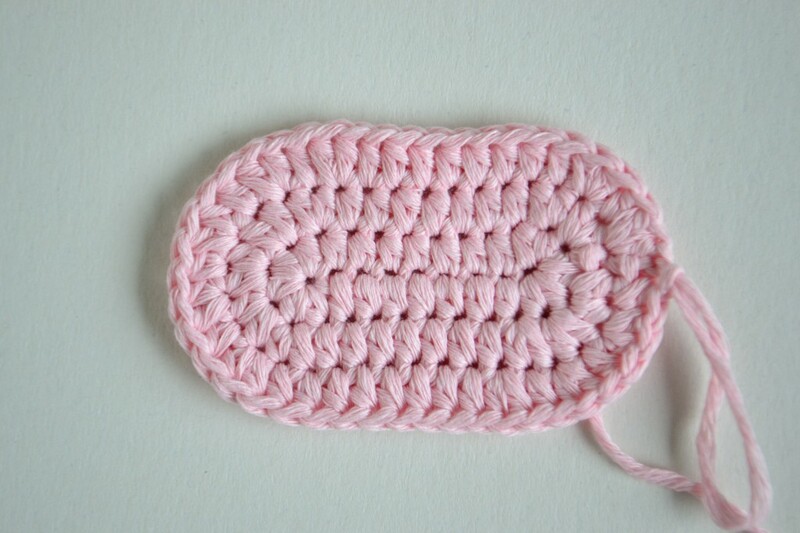 If no, use an even larger hook and a thicker yarn. Sometimes changing the size of the final item can demand changes in the pattern. In this case you have to rewrite the pattern and adjust it for bigger sizes. As I would have to do it in your case. 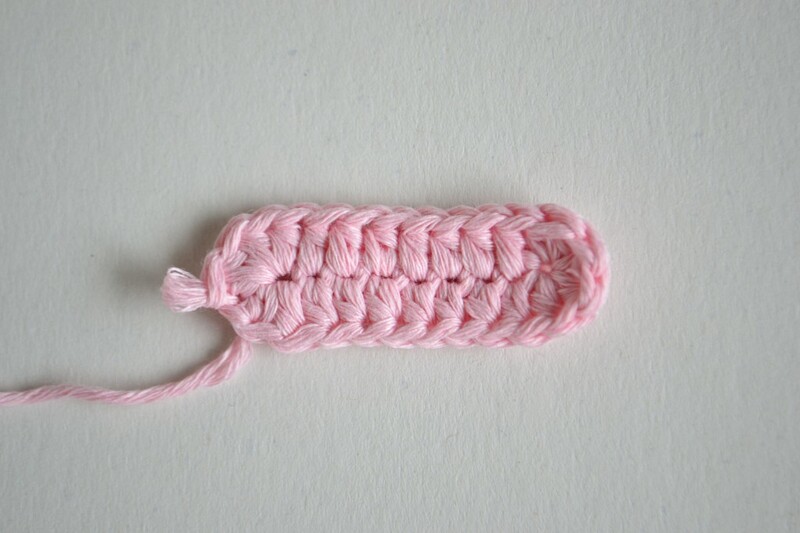 I’m making them for my mum’s, friends baby. Her name is Georgia. She’s so sweet. I didn’t even look up piggy? boots before I looked up the pattern. I just thought of them myself…. they are sooooooooooooo cute. Plus can you make some Zebra ones. They would be soo cute. Thank you so much! What talent you have!!! Wow! I have a very special little one I would like to make these for, thank you for the pattern and for sharing your talent!! Soooo cute!!!!! Cannot wait to get home and try this! The pattern that you have shown on the website, what is the sole length?? My niece has 4.75″ feet, and I would love to make her these! Would also love to try and make a chick one because her nana loooooves chicks on her clothes!!! Thank you for sharing!!! I love these piggie slippers I can’t wait to make them for my granddaughter. Thank you for posting the pattern. Thank you, I love these little piggy shoes. I have made one, and I am on the second in the smallest size (still have the ears and nose to do). I think there may be an error on row 3 of the body of the shoe, where you say sc 10 then repeat 2hdc together then 1 hdc 5 times, then 2hdc together, then sc 11. I have far more than 11 left, and what I did was repeat the 2hdc tog then 1 hdc 7 times, then it worked out, without the final 2 hdc tog. row 4 then worked perfectly. 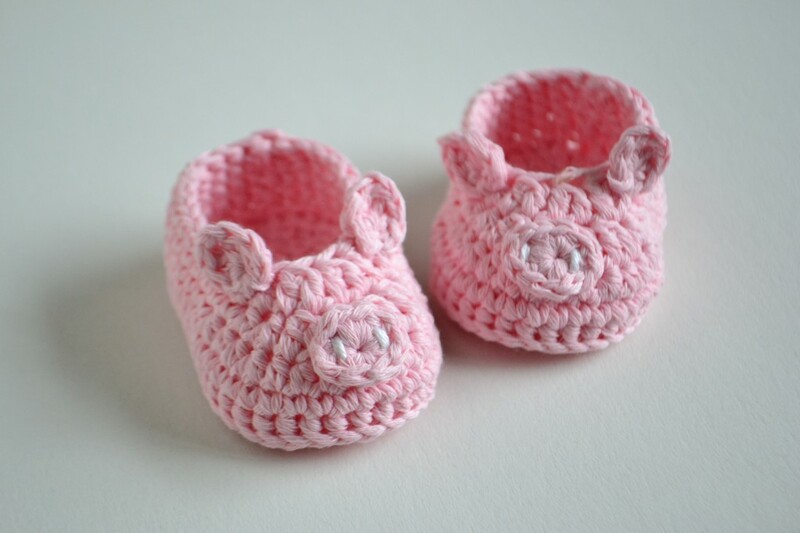 I checked the pattern for Piggy booties again, I can’t find any errors in round 3. You are mentioning that you have to repeat (hdc2tog, than hdc into the next one) 5 times. In the pattern is written repeat (hdc2tog, hdc into next 2) 5 times. 🙂 You have to repeat what is in () 5 times. And this is, join first two with hdc2tog stitch, than work 1 hdc into the next 2 stitches. Oh, I read it wrong, was only doing one hdc in between the decrease stitches. Thank you. My booties look ok though, I am about to blog them. I will make another pair now to see if they are better! I forgot to say, my little grandson loved them, he asked “are they for my baby?”. He is going to have a little sister soon. Thank you for the pattern. Love all your patterns and looking forward to making them. You are a very talented lady. I made a second pair this time following the pattern more carefully lol, I have improved my tail modification this time too. just found your site LOVE IT!!! thanks for sharing your wonderful patterns!!! Piggy booties! That’s better than bacon! This means a lot from a household that thinks bacon is a condiment (just kidding). I’ve been crocheting for over 46 years and your pattern and photos are the best! What’s even better is that they are free! I was looking for free patterns and everything redirected me to a pintriest, eBay or etsy site that wanted payment for a pattern. Some were upwards of $5 each. I’m always delighted to share patterns with fellow crocheters. I guess I feel everyone should. First, thank for sharing. 2nd, you have a wonderful gift to not only crochet, but to write clear directions and take photos where there might be an issue. 3rd, your designs are so adorable. I have two piggys to finish up tomorrow for my great great grand niece! Thanks to you Dorateja (such a lovely name too)! I’m in love with these! In excited to make them as my first pair of baby booties:) I’m wondering what yarn you’ve used, I love the look of it and what I have just does it no justice. Thanks!!! Is there a printable version with the picture tutorial. I usually print out a pattern because I work from instructions as well as pictures. I am also not able to sit at the computer for hours at a time crocheting which is why I prefer to print it out. Found another pattern with a printable version. Thanks anyway. thank you so much for learning!! Hi. I loved your pattern! It was so clearly written and easy to follow. I made these little slippers last night in the smallest size and even though they didn’t turn out quite the way I would have liked, I think it’s due to the kind of yarn I used, they are still adorable. I do have one question. In round 1, for the upper part of the shoe, you didn’t say what stitch to do. I did a hdc all the way around and was on my second bootie before I realized the pattern didn’t say. Looking at the picture you have posted and the slippers I made it looks to me that I should have done sc all the way around. I want to make these again so I was hoping to know which to do next time. Thanks again for the free pattern! I can’t wait to give them as a Christmas gift! Thank you! I watched the video last night AFTER I posted my comment. Now I know what I did wrong! Thanks for getting back to me. I learned how to crochet from watching videos and now I can (usually) read a pattern and undertand it lol. Thanks again! 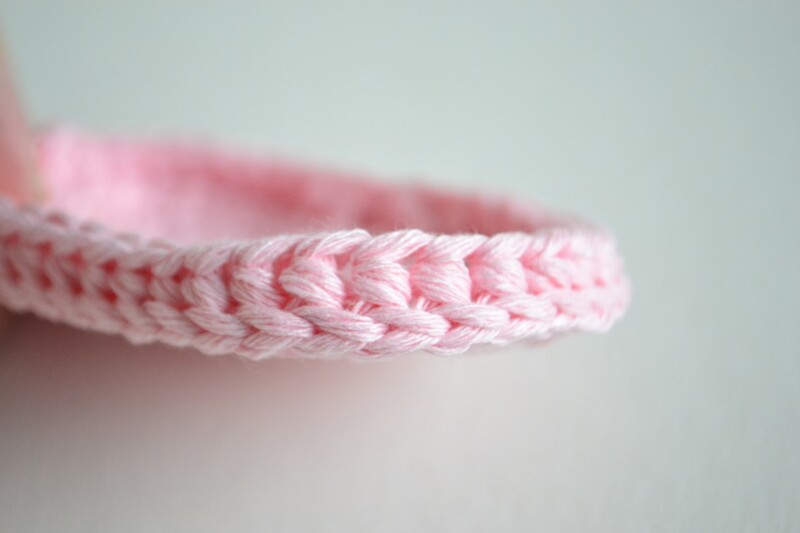 I got more pink yarn and I’m going to give it another shot ? Pure joy making these sweet as cotton candy piggies for my grand niece. Thank you so much. This was so generous of you to share. These are going to have a close friendsh with baby drool. Absolutely adorable! I just love all of your patterns. You make them easy to follow. 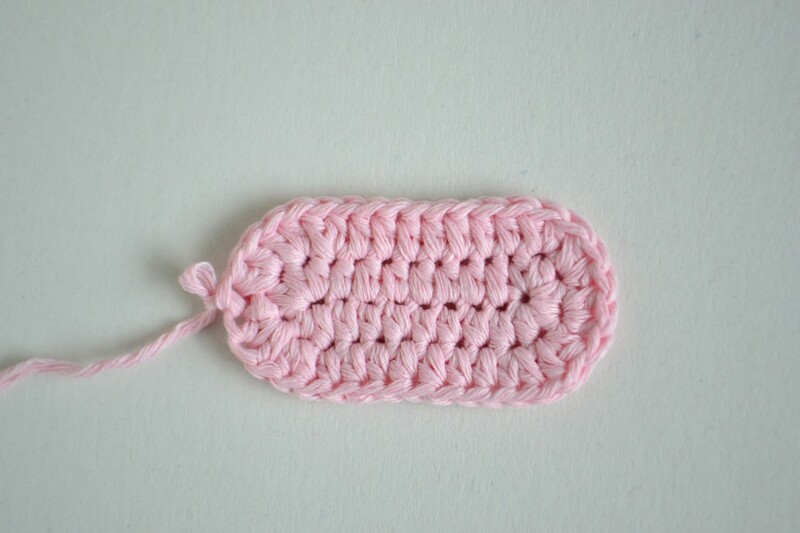 Have you ever made baby booties out of peaches and cream yarn? Thanks a lot! I managed to make the piggy booties. It didn’t come out totally right since I used a 1.75mm needle. So didn’t gauge the number of stitches quite right. But I sort of got the hang of how to do it. Thank you for sharing this lovely pattern! Can I just ask – round 1 of the upper shoe – is the first BPhdc in the same stitch as the chain 1? Hiii…my name is Nisha. I crochet at times. But after looking at ur work…I’m so in love with it. You have just inspired me more. 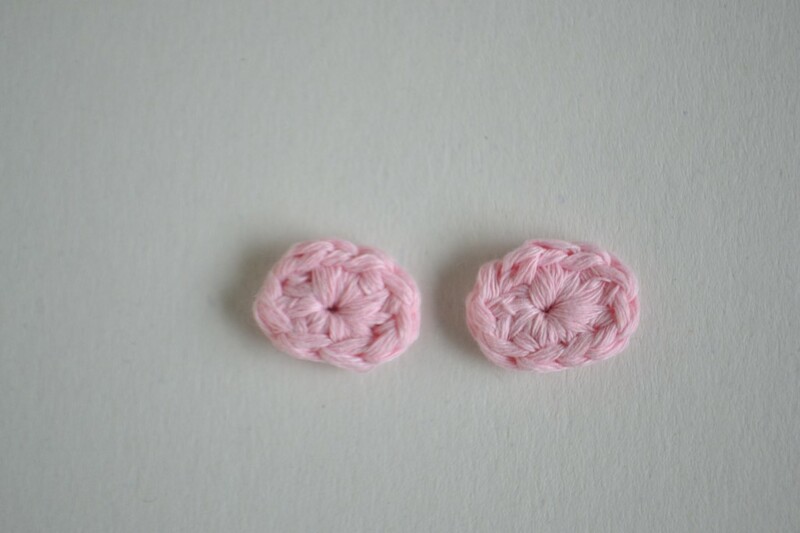 I would love to know each and every techniques of crocheting from you. I did the baby piggy booties they sre so cute. Now can I have a picture for Mom of piggy boots and the pattern.